For some time now there has been widespread public consensus accepting the view that global climate change is happening, that its effects are potentially very serious and its causes are primarily a result of human activity. A number of dissenting voices have recently emerged, however, with several scientists and politicians questioning the established consensus and suggesting that any changes to the world’s climate are normal, cyclical phenomena and are not something caused by the actions of humans. Do these sceptical commentators speak for a significant proportion of the scientific community as a whole, or do they only represent the views of a small minority? The purpose of this overview is to consider the facts and figures on both sides. Global warming, most climate scientists now agree, is caused by the so-called ‘greenhouse effect’. This process involves heat from the surface of the Earth becoming trapped by the planet’s atmosphere rather than radiating out into space. The link with human activity is that the build-up of certain gases in the atmosphere serves to trap heat and exacerbates the greenhouse effect. These gases include carbon dioxide, nitrous oxide, methane, chlorofluorocarbons and water vapour. The increase in the concentration of these gases in the atmosphere over the past two centuries can be directly linked to human economic, agricultural and industrial activity. An alternative explanation for global warming could be the process known as solar irradiance, which basically means the Sun producing increased levels of energy resulting in higher levels of solar heat reaching the Earth’s atmosphere. However, with access to climate records going back as far as 1750 scientists were not able to discern any evidence to support this hypothesis. Indeed, if global warming was a result of increased solar activity scientists would expect to see evidence of warming to all layers of the Earth’s atmosphere. However, our upper atmosphere seems to be cooling and the warming is taking place at a lower level clearly, most climate scientists suggest, as a result of the greenhouse effect. As far back as 1995 the Intergovernmental Panel on Climate Change (IPCC) suggested that ‘on the balance of evidence’ human activity was having a significant impact on the world’s climate. By the IPCC’s Fourth Assessment Report in 2007 this view was expressed even more strongly with the ‘unequivocal’ assertion that climate change over the previous fifty years had been influenced by the actions of humans. These conclusions were shared by the vast majority of scientists in the earth science field, yet it took some time before an awareness of this scientific consensus was taken up by the public. As recently as 2006 a survey by Time magazine found that some sixty-four per cent of Americans thought the debate was still ongoing amongst the scientific community with a significant number of scientists rejecting the idea of a link between human activity and climate change. Since that poll in 2006 public awareness in the United States has progressed only very slowly. A paper by Peter T. Doran and Maggie Kendall Zimmerman in 2009 reported that no more than fifty-two per cent of Americans thought global warming was an accepted scientific view and just forty-seven per cent thought scientists believed this was caused by human activities. 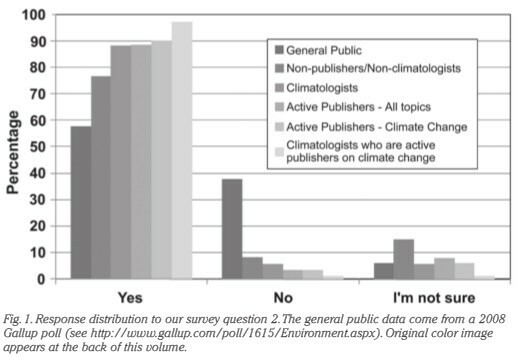 In other words, the American public still underestimated the degree of consensus in the scientific community. So what is the evidence for a scientific consensus about global warming and its causes? The weight of evidence starts at the highest level of the scientific establishment. The IPCC was set-up in 1988 and was tasked with reaching an international consensus on climate change. The Panel’s brief was provided by UN General Assembly Resolution 43/53 which directed it to ‘prepare a comprehensive review and recommendations with respect to the state of knowledge of the science of climate change; the social and economic impact of climate change’. The IPCC is not alone in this evaluation; in the United States the National Academy of Sciences, American Meteorological Society, American Geophysical Union and American Association for the Advancement of Science have all come out in support of the consensus view. According to the eminent Harvard professor of the history of science, Naomi Oreskes, they have all come to the conclusion that the ‘evidence for human modification of climate is compelling’. Dr Oreskes based her 2004 research on an analysis of 928 scientific papers. These were divided into six categories: explicit endorsement of the consensus position, evaluation of impacts, mitigation proposals, methods, paleoclimate analysis, and rejection of the consensus position. Some seventy-five per cent of papers were encompassed by the first three categories and gave either explicit or implicit support to the consensus view. Of the rest of the papers twenty-five per cent covered methods or paleoclimate and took no particular position on climate change. None of the research, however, opposed the consensus position. As a follow-up to Dr Oreskes’s work Harris Interactive questioned 489 randomly selected US climate scientists in 2007. Ninety-seven per cent of those who responded agreed that global temperatures had risen over the previous hundred years and eighty-four per cent believed that this rise was related to human activity. Only five percent thought there was no link to human activity. Forty-one per cent of respondents warned that the effects of global warming would be ‘near catastrophic’ during the next fifty to a hundred years. Similar research to find evidence of the perceived scientific consensus was being conducted elsewhere during the same period. Professors Dennis Bray and Hans von Storch of the Germany’s Institute for Coastal Research at the Helmholtz Research Centre carried out a web-based survey in 2008. They contacted 2,059 climate scientists in thirty-four countries and had a response rate of eighteen per cent. Their key finding was that 67.1 per cent of Earth scientists were ‘very much convinced’ that climate change was happening. In a key body of research published in 2009 two University of Illinois at Chicago researchers, Doran and Kendall Zimmerman, examined attitudes to climate change amongst the Earth science community. They were concerned that the general public were still sceptical about their being a scientific consensus on anthropogenic climate change; a previous survey found that just forty-seven per cent of Americans accepted the scientific consensus hypothesis. They also wished to counter those who had challenged Dr Oreskes’s research. Doran and Kendall Zimmerman’s report, ‘Examining the Scientific Consensus on Climate Change’, was based on an internet survey. A total of 10,257 Earth scientists at universities, research institutes and government agencies were contacted and invited to complete a short questionnaire. The scientists selected were all members of the American Geological Institute, which Kendall Zimmerman describes as: ‘a non-profit federation of forty-four geoscientific and professional associations representing more than 100,000 geologists, geophysicists and other Earth scientists.’ In order to maximise the response rate, the survey was designed to be completed in little more than two minutes. Of those contacted 3,146 replied, a response rate of 30.7 per cent. Ninety per cent of respondents were attached to US institutions, six per cent were based in Canada and the rest in some twenty-one other countries. More than ninety per cent of respondents had PhDs and a further seven per cent were qualified to Master’s level. General geology, hydrology/ hydrogeology and palaeontology each represented between five and seven per cent. In terms of specialist research activity some 8.5 per cent of participants reported that more than fifty per cent of their peer- reviewed publications in recent years had been on the subject of climate change. When compared with pre-1800 levels, do you think that mean global temperatures have generally risen, fallen, or remained relatively constant? Eighty-two per cent agreed that human activity had made a significant contribution to this climate change. Doran and Kendall Zimmerman then drilled down into the responses to these two questions to focus on the answers given by scientists who were climate change specialists. They found that 96.2 per cent (76 out of 79) of this group agreed that global temperatures had risen and 97.4 per cent (75 out of 77) agreed that human activity had made a significant contribution to this climate change. At the other end of the spectrum of opinion, the two categories of specialists with the lowest percentage of respondents answering ‘yes’ to the question on human activity were economic geologists (with forty-seven per cent agreeing) and meteorologists (of whom sixty-four per cent agreed). Critics of the report contended that the respondents were a self-selected group and that those contacted were primarily North American and not necessarily representative of international opinion. The ongoing debate among scientists about the causes of climate change, Doran and Kendall Zimmerman contend, is largely a case of mistaken perception by the general public. The scientific community has, in fact, reached a widespread consensus on this issue. The challenge, they conclude, is how to communicate the facts about this consensus to the public. More specifically the challenge is to convince people that action needs to be taken. While a large percentage of people in America and elsewhere may accept the weight of scientific evidence when it is put before them, far fewer of this group are willing to make the lifestyle changes necessary to reduce the rate of greenhouse gas emissions. This somewhat complacent view is further reinforced by the lobbying of those with a vested interest in the greenhouse gas producing industries. Climate change is a complex process which requires careful observation and accurate record-keeping over a prolonged period of time in order to perceive any underlying patterns and trends. The American public, just like people everywhere else, are much more focussed on the day-to-day weather than they are on longer-term climactic trends. Our personal experience of the weather is subjective and short-term so that our perception of trends is rarely accurate. Even when the American public experience extreme weather events, such as flooding, very few of people make a causal link between extreme weather and climate change. Indeed, most people in the US perceive such issues as the economy and terrorism as greater potential risks than global warming. US public perception of the risks arising from climate change, as we have discussed, lags a long way behind that of the American scientific community. For example, an opinion poll conducted by Pew Global attitudes Project in 2006 reported that no more than seventy-five per cent of Americans believed global warming was a ‘very’ or ‘somewhat’ serious concern. For several reasons public attitudes in the United States are critical not just at home, but at a global level too. Though Americans total only five per cent of the world’s population, the nation is the planet’s largest emitter of carbon dioxide and other greenhouse gases, contributing approximately twenty-five per cent of global emissions. In essence, if America does not succeed in controlling its carbon emissions, the world fails to do so too. In a study conducted in 2003 Dr Anthony A Leiserowitz, Director of Climate Change Communication at Yale University, reported that the average American emits something like 5.40 tonnes of CO2 (expressed as carbon) every year. As a comparator he calculated that the average Japanese person emits 2.55 tonnes per year, while each Chinese person emits only 0.60 and the average Indian only 0.29 tonnes per year. Seven years later the eminent US climate scientists Tom Boden, Bob Andres and Gregg Marland reported that while the US and Japanese per capita figures had fallen slightly, those for China and India had increased significantly. The primary concerns in Leiserowitz’s report in many ways anticipated the later findings of Doran and Kendall Zimmerman: that the American public has a relatively low-level of concern about the significance of world climate change trends. Whilst a majority of Americans surveyed, some sixty-eight per cent, expressed concerns about the global impact of climate change, particularly on wildlife and habitats, only thirteen per cent had any real worries about the impact on them, their families and communities. The research conducted by Peter T. Doran and Maggie Kendall Zimmerman and earlier Anthony A Leiserowitz concluded that climate change is consistently given a low rating by the US public in issue-ranking surveys. Leiserowitz in particular suggests that this is not so much a problem of awareness, as most Americans are very aware of the existence of climate change, but it is a lack of willingness to engage with the issue and to make it a political and economic priority. This lack of concern is partly due, perhaps, to the impact of the American petro-chemical lobby which has vigorously challenged much of the scientific consensus over a number of years, but it also results from the difficulty the average person has in understanding the complexity of climate science. Of course, history tells us that it is always possible that a scientific consensus may be wrong and further research may lead us to reach different conclusions. For example, it was once the established scientific belief that the Sun revolved around the Earth until Galileo and his successors proved otherwise. However, we can be clear that the current consensus on climate change has been reached after decades of rigorous, peer-reviewed research and it expresses the view of the vast majority of specialists. The challenge Earth scientists now face is to successfully communicate their research and conclusions on anthropogenic climate change in a way the ordinary citizen will understand.